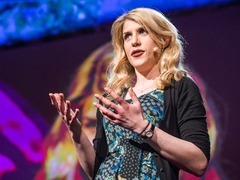 Eleanor Longden’s new TED Book, Learning from the Voices in My Head, charts her harrowing journey from terrified young woman trembling in a psychiatric ward to a Eleanor Longden: The voices in my head stable, successful doctoral candidate who has learned to live peacefully with her inner voices, medication-free. She recounts how her mind shattered into pieces and how she slowly and delicately put it back together. In recent decades, psychiatry has come to view mental illness through a mainly biological lens, hunting for causes and cures in our brain chemistry. While that approach helps some patients, Longden says, it very nearly destroyed her. She testifies to the need to view patients as individuals, not diagnoses, and to empower each one to heal in his or her own way. As a Ph.D. student in psychology, she also serves up a hefty scientific literature on the problems with over-medicalizing mental illness. Learning from the Voices in my Head is available for the Kindle, the Nook, and through the iBookstore. my relation is also suffering from schizophrenia for the last 10 years. still she is on medication of antipsycotic drug.Now she is using clozapine 100mg at night times.Is there any perminent remedy for the disease.